Are You Keeping Your Guests in the Dark? Recently, an amazing Jewish wedding program infographic was posted in our Facebook group for Jewish interfaith weddings (planning a wedding? Join us! ), and we all flipped over how pretty and easy to follow it was. What a perfect way to help guests who aren’t familiar with Jewish weddings to understand what’s going on. Jewish weddings have many beautiful rituals, and I wanted to connect with the artist behind the program (Ling’s Design Studio) to see where she got the idea and how she helps couples create inclusive wedding ceremonies. Spoiler: She’s never been to a Jewish wedding! Who’s going to invite her so she can see it firsthand? Check out this interfaith-friendly, egalitarian, customizable design we love. Happy planning! Why is it important for couples to have a wedding program—in particular couples who come from two different faith backgrounds? Ling: Having a wedding program for a couple is more than just about what you’d like to inform your guests with in regards to the order of your wedding ceremony; it’s all about getting the “personal touch” to make it more fun nowadays. I have not been to a Jewish wedding before, but I’ve learned so much from creating the program from my clients. With two people coming from different faith backgrounds, it’s definitely helpful to have it to show your guests who are not Jewish what Jewish wedding customs are all about. In this particular program, your guests will be learning Jewish wedding customs through the fun infographic. It’s a fun way to break away from the traditional wedding programs we used to have! How did you start creating programs for weddings? As I began to accept custom orders, I was asked to design a Jewish infographic design for a buyer. This particular Jewish program was how it all started. Since then, the item became very popular in the Jewish community. Are there any other customs or traditions that couples can include in their program aside from what’s listed in the sample Jewish program? Do you ever have couples ask for a program that describes multiple religions or cultures? I haven’t had that request yet but I do take any custom orders. What are some other customizations people have asked for? Some couples would ask to include “Hakafot,” “Kiddush Cup” and “Yichud.” One buyer also asked me to list out each blessing of “Sheva Brachot.” I also made a timeline, and added a thank you note. What has been most interesting or surprising to you to learn about Jewish weddings while creating these programs? I learned that Jewish weddings are very cultural with many beautiful meanings for a couple. Most of the customs are about the couple and their family. It really emphasizes the connection and union between the bride and groom. One of the interesting things is that I never knew that the right index finger has the closest bloodline to the heart before I created this program. I thought this was very special. 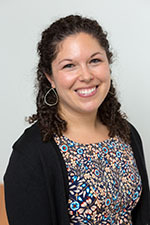 Lindsey Silken is the editorial director of InterfaithFamily based in Newton, MA. She can be reached at lindseys@interfaithfamily.com.